This Online EMT Refresher course is CAPCE Accredited and meets the NREMT EMT Refresher requirements. 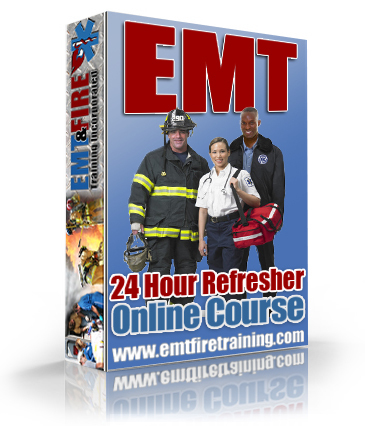 •You need an EMT Refresher to maintain your NREMT certification. •You failed the NREMT exam 3 times and need remedial training. •Your NREMT has expired and you are needing to apply under the NREMT re-entry policy. 1. Give you CAPCE credit to meet the NREMT EMT refresher requirement. 2. Allow you to take the NREMT examination 3 more times. NOTE: Other companies claim to provide a true EMT Refresher, yet do not offer interactive instructor-led sessions (VILT). The NREMT REQUIRES that your refresher training have at least 14 hours of instructor-led instruction. This can be accomplished in a traditional or virtual classroom. IF IN DOUBT, contact the NREMT to verify! Check the for dates of lectures. This 24 hour course is CAPCE Accredited. Included are 14 hours of online Virtual Instructor Led Training (VILT) lectures held in our virtual classroom as well as 10 hours of self paced Distributive Learning (DL) lectures available online in our learning management system. Students may complete the lectures in any order. Check the for dates of VILT lectures. Students must complete each lecture and pass all exams with a score of 80% or better. (Students are allowed multiple exam attempts). Upon successful completion of the lectures, a certificate of completion will be issued and made available to the student inside the online learning management system. Check the for lecture dates. Each lecture is held multiple times each month. Click the calendar to see available dates for Live Modules! • This course utilizes flash based modules. You must use a browser that supports Flash. • High speed internet connection for viewing videos and virtual classroom attendance. • Headset with microphone IF you intend on asking questions verbally. Headset is NOT required. Questions may be asked via chat. • A desire to participate and learn. Attendance will be taken throughout the EMT refresher lectures (VILT). If your attendance cannot be verified you will not be given credit for that time. Each class held in the virtual classroom will consist of several powerpoint lectures from AAOS Emergency Care and Transportation of the Sick and Injured AND an assessment exam corresponding to each. No verbal questions will be permitted until completion of the lecture, however, Instructors will be taking questions via chat at all times. This class format allows students to get questions answered immediately while not stopping the lecture. More refresher material is covered and students can monitor chat questions and answers if they choose. If you intend on asking verbal questions at the completion of each lecture, you must have headphones and a mic. Using your computers speakers and built in mic is not permitted as they can interfere with each other and may cause inaudible speech and feedback. Internet connection problems. We understand that issues may arise with connectivity or software during the instructor led lectures in the virtual classroom. If something unforeseen interferes with a students ability to view and or hear the lectures, alternatives arrangements can be made to view the lectures in a different format or at a different time. * EMT & Fire Training Inc. is a Proprietary School registered with the Idaho Board of Education. In addition, the school is recognized as a training institution by the Idaho Department of Emergency Medical Services.